Ulaanbaatar (Улаанбаатар), also known as Ulan Bator or simply just UB, is the capital of Mongolia. With a population of around 1.3 million, it is the largest city in Mongolia, standing as its political, commercial, industrial and cultural hub. For business and pleasure trips alike, you will find yourself coming to the city at least once. Knowing and exploring the city properly can help you understand the country’ history and its wonderful people. One will often see the past and the present are still living side by side. The city is officially divided into 9 districts with 7 of them located within or around the city area. Nalaikh and Baganuur are the two districts that have their own city infrastructure located within 138 km radius of the city. Both of these cities are located on the east side of UB and were originally built as mining towns. On any eastbound journeys, travelers will find themselves stopping traveling through these cities. In the capital city, the four original districts are Sukhbaatar, Songino Khairkhan, Bayanzurkh and Bayangol where majority of the city population live today. Most downtown premises are located in the Sukhbaatar district. In the history of the Mongolian people, there have been several well-known cities built as capital cities such as Kharakhorum during the 13th century Great Mongolian Empire. But none of them survived as an active capital city until the 16th century. 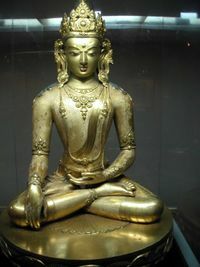 With the active introduction of Lamaism in Mongolia from the 16th century, permanent monastic establishments started to emerge when Tibetan Buddhism flourished. The most important of such settlements was the residency palace of Mongolia’s first spiritual leader named Zanabazar or Jebtsundamba Khutuktu in the year 1649. The year is now considered as the founding date of Mongolia’s modern capital city, Ulaanbaatar. The city was first named Ikh Khuree, literally meaning “large circle” as the city was circular shaped. 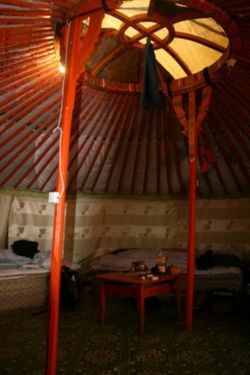 After changing locations in the central part of Mongolia over 20 times, it settled at its current location in the year of 1778. Much of the modern architecture of Ulaanbaatar started to shape in the 20th century with the influence from Russian architecture. The modern day UB showcases a mix of Soviet architecture, ger settlements, Buddhist monasteries and 21st century high rises. Among Buddhist temples, most notables are the Gandan Tegchinlen Monastery, Choijin Lama Temple and Bogd Khan Winter Palace Museum . Travelers who take the time to get to explore the city will discover a hospitable and warm-hearted people. The demographics of city are divided into two major parts. One part of the population lives in condominiums in the central part of the city while the majority of the population lives in what is called as ger districts. These districts, traditionally a home to many of the city’s blue and white collared workers, became lately a home to many migrating ex-nomads who in recent years have come to the city to find work after severe winters have killed their livestock. Peace Avenue (Enkh Taivny Örgön Chölöö) is the main street and it stretches from east to west through the center. It's the main shopping street and many of the restaurants are found alongside it. The street also passes by the southern edge of the central square, Chinggis Square. Tourist Information Centers are located on the first floor of Ulaanbaatar Bank Small Ring#15 and at Seoul Street. Ulaanbaatar city is a center of Mongolian political, economic, society and culture. Around 45% of total population and 65% of total companies are only in Ulaanbaatar. Therefore, majority of deposits and loans granted to individuals and companies, cars and doctors are in Ulaanbaatar city. Role of Ulaanbaatar to Mongolian economy is massive as the country’s best health, education, production and financial operations are centered in the city. 88.5% of total universities of Mongolia locate in Ulaanbaatar city and 95.3% of total students of the country study also in the city. Thus, the city is the center of social, economic, administrative and cultural activities. Currently, the only airport for international arrivals is through the Chinggis Khaan International Airport (IATA: ULN), which is located 18 km to the southwest of downtown Ulaanbaatar. It was formerly called as "Buyant Ukhaa", which is the name of the hill it was built upon. The airport was reconstructed in 1986, and the immigration, customs formalities and luggage delivery are relatively efficient. A facility for transit flight was recently added. In 2017, UB bus network underwent significant changes and routes 11 and 22 previously mentioned in various sources no offer service between airport and the city. Bus number 7 will take you from the airport along Chinggis Ave. Prepaid transit card must be used (no cash paymnet), one could be purchased and loaded inside the airport terminal. As of June 2017, official taxi service costs 20000 MNT (per car) one way to/from city center. It can be arranged at the desk inside the baggage claim and payment must be made in cash to the driver upon arrival (there is an ATM inside the arrivals hall, outside the baggage claim). 1800-1991 is the phone number for this taxi service to request a ride to the airport. 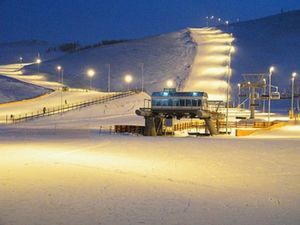 Hunnu Airlines offers flights from Chinese cities of Erlian, Manzhouli and Hailar as well as to domestic cities of Hovd, Ulaangam, Uliastai, Choibalsan, Muron and Dalanzadgad (http://www.hunnuair.com/en/timetabled). Korean Air also flies daily from Seoul to ULN. Air China flies to and from Beijing. The Russian airline Aeroflot flies daily between Moscow and Ulaanbaatar. Turkish Airlines fly direct from Istanbul, stopping at Kyrgyzstan en route. Direct (but long) journeys are possible from Moscow, Russia and Beijing, China on the Trans-Mongolian line of the Trans-Siberian Railway. Trains also run to the Chinese border towns of Erlian and Jining 3-4 times a week. There's also a daily train to/from Irkutsk in Russia, which can also be reached from Vladivostok at the eastern end of the Trans-Siberian. Trains from Beijing run once a week (on Tuesdays) and seats can be reserved in person only at the Beijing Railway Station or at the International Hotel in Beijing (a ten-minute walk north of the Beijing Railway Station. The journey takes about 26 hours. Past travellers have recommended brining a facemask as sandstorms in the Gobi desert may bring dust into the train. Train entries from Russia are also possible from Moscow, Irkutsk and Ulan-Ude. Daily train leaves from Irkutsk  at 1635 Moscow time, arriving two days later in Ulaanbaatar. Train from Ulan-Ude departs at 0140 Moscow time, arriving next day in Ulaanbaatar. Both tickets can be booked through travel agencies in Irkutsk or Ulaanbaatar. There are three port entries, which is open to third country citizens to make an entry. All but two has a direct linage to Ulaanbaatar via a paved road. If you are coming from Russia, you can make an entry through Altanbulag of Selenge province. From China, one can enter through Zamyn Uud in Dornogobi province. Both roads will connect at Ulaanbaatar. If you are coming from Kazakhstan, a local Tsagaannuur port is the entry point through it is located the farthest and only connected by a dirt road to Ulaanbaatar. Coming from the north the paved road starts at the Russian Border. Coming from the south (the Gobi) the paved road starts at Choir. Coming from the north-east the paved road starts at Bulgan . Once in the country, any small or big towns will have a local bus or van traveling to UB. Buses used to be notorious for being late and on some routes for not even arriving on the scheduled day. But due to more bus companies emerging and competition, the service and quality of buses have improved drastically lately. Domestic buses usually go to Dragon Center (СХД18-р хороо, 18072 Улаанбаатар), Teevriin Tovchoo (near Main Railway Station ) and the eastern bus station near the Botanical Gardens (the Gardens are completely destroyed, but the location is well known to the locals). Generally, there are two types of taxi services you can use in the city. There are cabs that carry the designated taxi symbols and there are non-marked private cars driven by their owners who pull over to pick passengers. Don’t be surprised if any car just stops and offers a ride. It is the most commonly available taxi service at the moment, a practice that started in early 1990s when there were fewer cars in the streets. Some drivers even pick up passengers while transporting infants. Taxis are cheap, charging around T800 per kilometer, but a foreigners have often been overcharged. After midnight charge goes up to T1,000 per kilometer. You may get a better and more reliable deal by seeking out older drivers in their own cars, rather than the official yellow cabs, now there are new white cabs with large square meter LCD on the dash. Younger drivers can sometimes get extremely opportunistic and try to hold you or your luggage at ransom until you pay them extraordinary amounts of money. Always negotiate the fare in advance and don't be fooled by tricks like "I meant 3,000 for each of you." Please note that few taxi drivers speak English, so it's best to have the name and destination written in Mongolian to the driver. Tip: If you want to get a ride with one of the aforementioned budget-friendly drivers, a recent tech startup called EasyRide is used by local drivers to find customers. They offer support in the English language, and their app is available on both the Android and iOS platforms. There is also an English speaking taxi service called Help Taxi, ☎ +976 9965 2371. editThey operate a small fleet of black taxis with gold lettering, and when booking they will give you the license plate of the car picking you up if you request it. While they are not as inexpensive as a normal taxi, they are cheap by Western standards and are a low-stress way of getting to important places like a medical clinic or airport. Most attractions in the city are located closer to the Peace Avenue, which is the city’s main horizontal avenue. Therefore, by taking a bus from one end to another will take you close to most of these sites. From example, in order to visit Gandan Monastery, take a bus along the line that stops at the West Junction (in Mongolian: baruun 4 zam) junction, which is a popular landmark for directions. It is where Ramada Inn hotel is also located. Gandan Monastery is visible just to the north side of it. Buses are regular and have a fixed charge of T500 per ride. Electric trolley-buses cost T300 but are slower and run fewer routes. After midnight, only trolley-buses are available at a rate of T1,000 per ride. But they go for only two main routes. Smaller buses (really just vans), called micro-bus, are equally accessible at T500. These have someone who hangs out the window at each stop shouting the name of the destination in rapid Mongolian. A bit hard to understand. Many of the city buses go out to the edge of the city. Route 22, goes southwest to the Bird Farm along the Tuul River. Catch the bus at the Ard Cinema bus stop, the Cinema has been replaced by a Khas Bank. This bus stop is located on Bagatoiruu Street, from the central Post Office walk west along Peace Ave. At the intersection with the traffic lights, cross the street and turn right (north) half a block and you will reach a small square with the bus stop. Walking is also an option as the city center is quite compact. Having only one main avenue, Ulaanbaatar stretches from east to west and it's also easy to draw a mental map. But getting around ger districts can be puzzling. Get a good city map at the Mongolian Government Map shop, located on Ih Toiruu Street. West from the State Department Store three blocks, the first intersection with traffic lights, turn right (north) about one-half block, on the east side of the street you will see a yellow and blue Elba Appliance store. The Map Shop is behind and inline with the North wall of the Elba. But purchasing a map from the airport would help save you a lot of time. Finding specific places or offices by address is quite challenging because locals will usually tell you the places by nearest landmarks such as West Junction (supposed to be Undsen Huuliin gudamj) and Urt Tsagaan (which is Tourist Street1) and along the department store (Peace avenue). Sometimes locals will not know any better than you as they too never seen some street names put on the streets. Especially when you buy guide books, look for books with pictures printed so that it would help you ask locals about places rather than only showing written addresses with postal codes. Ulaanbaatar is notorious for hectic traffic and rude drivers which pose dangers for crossing roads. Tougher traffics laws have been introduced lately as a result of which, the driving culture is getting better. 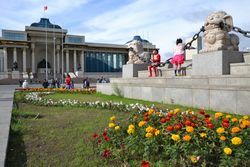 Like many capital cities in the world, Ulaanbaatar offers variety of sightseeing options ranging from historical sites to monasteries, museums, monument, parks and night clubs. Most of the historical sites, monasteries and museums are with in a walking distance from the central square Chinggis Khan. Note that most tourist sites have a separate camera/video fee (typically ₮10000-25000) in addition to the entrance fee. The city features many landmarks representing different periods of its history. From Soviet style relics to modern high rises, UB now has many attractions for different tastes and interests. Sükhbaatar Square is the Istanbul/Constantinople of Ulanbataar. Originally called Sükhbaatar Square it was renamed to Chinggis Khan Square in 2013 and then rerenamed Sukhbaatar Square in 2016. It is one of the largest squares in Asia. It has an equestrian statue of the 1921 revolution hero Sükhbaatar, and seated statue of Chinggis Khaan and his sons and 2 military generals (Urlugs). During the summer time, especially around mid July, variety of rock and folklore concerts, as well as parades and other cultural events take place regularly. In the southern side, you can see a small hill with a monument on its top, called, Zaisan Memorial. A huge communist-era monument is located on a hill in the south of the city. It represents the Russian and Mongolian heroes who fought together during WWI and WWII. Nowadays it is a popular viewpoint where you can see over the whole city. There's also a huge Buddhist statue at the bottom. Moving to the central west part of the city is the State Department Store, locally known as Ikh Delguur, literally translated as “mega shop”. It was the largest shopping mall in Mongolia during the communist period and still is one of the largest outlets for imported goods, grocery store and souvenir shop. Across the State Department Store is Mongolia’s circus, which was a popular family place in the communist period. UB has several compact but outstanding museums showcasing its natural and cultural heritage. They are informative and helps to understand and learn about Mongolia’s history and culture. 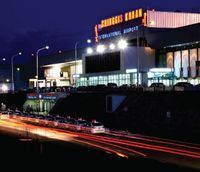 Ulaanbaatar features excellent mix of traditional and western style theatres, offering world class performances. Many of the traditional folklore bands play regularly around the world including in New York, London and Tokyo. In the summer season, you may com across world's top ballet dancers from Boston Balet theatre, performing at at Opera House. Turn into local art information sites such as Art Council and you may enrich your travel experience of Mongolia. There are many things to do UB from exploring monasteries and museums to watching, dancing and hiking in its parks. UB hosts a wide array of domestic and international plays and performances during their fall, winter and spring seasons. Staying in tuned to the schedules and available shows, you can have very entertaining stay in the city. Mongolia’s best rock and pop performers also stage their performances at the city’s key venues during this period. Information on their schedule can be obtained by contacting the sales offices of the following venues. You can also use Easyticket.mn schedule and tickets reservation for many of these performances. There are several modern cinemas that offer some of the latest blockbuster movies. Depending on which side of the city you are in. You can check for your favorite movie at one of the nearest cinemas. Most of them are also equipped with 3D screening and VIP rooms for private groups. Attend Naadam - the largest and most famous festival in Mongolia, which consists of competitions in the three traditional Mongolian sports of wrestling, horse racing and archery. The festival is an annual event and runs from July 10th to 12th. Traditional Costume Parade. On July 13 every year, Mongolia’s national summer festival, ethnic parade is organized at the Chinggis Khan Square. People from different tribes wear their uniquely designed costumes, making it a colorful spectacle to watch. Look around the Narantuul (AKA Black) Market: it is an interesting place and you can get great deals. They sell pets, souvenirs, cloth, shoes, socks, meat, fruits etc. Some people claim it is dangerous but outside of a few pickpockets (as in all large markets) it seemed quite safe. Mountain Biking - Bikes can be rented in town if you have not brought your own. Head into the hills directly to the south of the city (just south of the bike shops) for some great trails and excellent views of the city. Mongolian - there are several language schools in the city. Volunteer. Work is available for overseas visitors in the volunteer sector. New Choice, . can place potential volunteers in appropriate workplaces edit. English. Teaching English as a second language is an option for native English speakers. Mostly positions are in Ulaanbaatar, though they could be anywhere in the country. Those who find a teaching position after arriving in the country will need to leave the country to apply for a working visa. The school may or may not pay for this. UB has a host of souvenir shops aimed at Korean/Japanese and European/American tourists. While the quality of the goods varies, the price tends to be high at the downtown stores but on the outskirts, you can find some good deals. Most prices are at their actual value and haggling is discouraged. You'll likely just get a discount of 10-15%. Traditional clothes, boots and hats, cashmere garments, jewelry, leather wall hangings, miniature gers, bow and arrow sets and paintings. Peace Avenue and the Circus area are the main shopping areas. The 6th floor of the State Department Store has a section with souvenir paintings, but prices are higher than in some of the smaller stores. The Narantuul (AKA Black ) Market, known to locals simply as zach (зах), is the place to haggle over cheap clothes, toys, swords or Soviet propaganda pins. Only take a minimum of cash with you in a money belt or inner jacket pocket and leave all valuables at your accommodation, as pickpockets are common here. It's a ten-minute bus or taxi ride from the city center. Don't expect a tourist market though. This is primarily a huge open-air market for locals to buy clothing. Difficult to locate items of interest to tourists. To get here take either ч30A or ч30B from in front of Sükhbataar Square (on Peace Avenue). 9AM-7PM W-M, closed Tuesday. Tellers at the Golomt Bank can give up to USD500 per day cash advance on MasterCard and Visa. Most ATM's accept most international cards, including Maestro and Plus. An earlier report mentioned that Cirrus cards are only accepted at the airport, this is probably untrue. It is relatively easy to find an ATM to withdraw cash. As long as your ATM, debit or credit card has the VISA logo, you can withdraw tögrög, the local currency. Other card types are also accepted, simply not as widely, for example, the machines in the central Post Office and main street will not accept foreign MasterCards although they bear the logo. The machines in Golomt Bank branches are more reliable. Also on the 2nd floor of the State Department Store you can find an ATM accepting foreign cards. Many shops take credit cards, but some establishments run strictly on cash. Note that most credit card companies will pass on the 3% "foreign currency conversion fee" to you. There are many exchange offices in the center along Peace Avenue to change your currency into tugrugs. One is on the ground floor of the State Department Store. Better rates are at the Exchange Center on the second floor of the Flower Center. The Flower Center is located on Peace Ave. one block west of the Post Office, at the corner with traffic lights between the Post Office and State Department Store. Large hotels like the Ulaanbaatar Hotel one block east of Chinggis Square will exchange money 24/7 at the reception, which may be your only option if you arrive very late in the day. There are number good stores for finding books in the city. The bookstore on the 6th floor of the State Department Store could be looked for some books. Internom book store, located behind Ulaanbaatar Hotel has a corner as well. Az Khur, a large bookstore opened not long ago, has one of the best collections of English books. The store is located in the first floor of Munkhiin Useg publishing house, located opposite of the Mongolian Railway History Museum. Librairie Papillon. If you want to find very high quality books about Mongolia or the Mongolian language in European languages (French and English mostly), this place has a very large selection. They are located on University Ave., just past the main Mongolian National University building. The atmosphere is very nice, and is almost like taking a little break from Mongolia and entering France. They also have a large selection of European-language classics if you would like reading material for your journey. The old notion of “nobody travels to Mongolia for the food” might change soon as more and more good quality restaurants are opening in Ulaanbaatar, offering a good range of Western, Asian and Mongolian delicacies. You can get perfectly reasonable pizza for $3, even a night out at a fancy French cafe shouldn't pass $20. Consider splurging on a couple good meals here, especially if headed out for a long trek into the country. Fresh vegetables, especially in winter, are hard to come by and expensive. Korean (solongos khoolnee gazar) and Chinese restaurants dominate the city. As Asian restaurants in America tend to tailor their menu to the American palate, so in Ulaanbaatar do the East Asian restaurants tailor their menu to the Central Asian palate (meaning more meat!). You'll find numerous restaurants of just about every persuasion you would find anywhere in the world. You will immediately notice that both the restaurants and coffee houses (including the restrooms) are a magnitude cleaner that most anywhere else on the continent. For many that is quite a pleasant surprise. Restaurant foods are made fresh so expect to enjoy eating here. There is also very little litter on the streets and the tap water is safe for sanitation purposes, even for brushing your teeth. Absolutely clear and without odors or tastes. Throughout Ulaanbaatar are many small Гуанз (eateries) and Цайны Газарs (cafes.) Try one of these for cheap Mongolian food. Buuz usually costs ₮350-400. Most universities have a good cafeteria for cheap eats for ₮1800 (less than $1) - ₮2500 ($1.30). Khuushuur, which is a fried meat pie, is another popular street or fast food Mongolians love. Try them at one of the local cafeterias you might visit. Mongolian National University and Mongolian University of Science and Technology (both near the North East block from the Parliament Building) have good cafeterias. All university cafeterias have nutritionists so at least you know you are getting all the basic nutrients when you eat there. Nightlife in Ulaanbaatar is surprisingly wild but is best not experienced alone — try to get a local to join you. Most of the nightclubs play Trance, Techno, Electronic and House music, a few clubs play hip-hop music. The small clubs in the 3rd district and the Sansar micro district are best avoided. Be sure to apologize if you hit someone or step on his or her feet accidentally, because some Mongolians can be offended by it. Beer in clubs costs about ₮3500 (less than $2), other drinks such as vodka depend on measurements, for example a 100 g Vodka costs about ₮4500 ($2.25) The club life is very active on Wednesday, Friday and Saturday. On Fridays, it is very hard to find a seat in a club. According to state law, all clubs and pubs (bars) must be closed after midnight, but some clubs run until 4:00 AM. On the first of every month you can't buy any alcohol, be it in a shop or in a bar. Never go alone in the dark, especially on Fridays. Also never walk by yourself when you are drunk, or you may be arrested and end up in the drunk tank, not a pleasant place to be. Strings is a somewhat notorious club frequented by foreigners. It is very popular with Korean and other East Asian businessmen. Ikh Mongol is a cavernous club just south of the State Department Store. Choose between the main dining area, the fancy VIP upstairs, or secluded tables in the back. Most weekends have concerts from Mongolian acts. The restaurant brews several beers on tap, or get some of the more popular Mongolian brands for around ₮2000 a half-liter. Brauhaus goes for a German brewhouse look and succeeds. This bar is big but usually not noisy. It serves X Beer, a quite tasty local brew. Half-liters run around ₮2,500. Dublin Irish Pub It is known as the first small pub taking on Irish theme. Mostly friendly staff and cozy atmosphere. Located on the Amar Street. Grand Khaan Irish Pub Is located on Seoul street and is the largest Irish pub in the city. You can get Guinness here as well as other local beers. A mix of local and international diners gather. CSS Pub is a hole-in-wall pub across from the Ulaanbaatar Department Store (not the State Department). Though slightly worn around the edges, it offers a no-frills place to have a quiet drink. Try the fish. Chinggis Club (On the street that passes on the west side of Sukhbaatar Square, from Sukhbaatar Square go north past the second traffic light, on your left about 40m north of the intersection.). Co-located with the Chinggis Brewery, German style cooking and beer. Their own locally brewed light and dark beer on tap. USD10. Guest homes may not respond to email (only 2 of 5 responded to us). Be aware that in August 2009 the government passed a law requiring domestic transactions to be priced in the Mongolian currency (MNT). Some guest homes attempt to charge more than the price on their website saying their website is out-of-date. Some may change a price higher than the price you have agreed to pay from your on-line reservation, citing that the exchange rate has changed. Many guest homes operate also as Tour Guide/Operator/Agency and be more interested in selling a tour and devote less attention to the guest house facilities in room size/space, limited number of bathrooms/showers relative to the number of beds, internet WiFi service shut off at 22:00 and turned on at 09:00, and so forth. Ulaanbaatar generally does not offer great value for money in the mid-range accommodation market. Many mid-range options can be found along Embassy Rd and UNESCO Rd. Internet cafes - might be a good option if you are in the outskirts area which cost around ₮400-800 per hour. Mail - the Central Post Office is located on the southwest corner of Chinggis Square, and besides stamps it also sells a wide variety of reasonably priced postcards (though they may take up to two months to reach their destination! ), some very large, decorative collections of stamps (which are not for use) and a few nice calendars. Telephone - the city has an international call center. However, if you have access to a private phone, the most convenient way to make an international call is to use a prepaid card, such as BodiCom. Cell phone operators offer both prepaid GSM sim cards and handset rentals (currently Mobicom) as well as extensive roaming options for your convenience. The crime rate in Ulaanbaatar is "very high" compared to most Asian cities. Pickpocketing and violent muggings are a higher risk in the capital than in rural areas so it is advisable to avoid walking alone after dark. Street lighting is unreliable and visitors will occasionally come across drunks and stray dogs. The places where pickpocketing is the most frequent are buses and the Narantuul market (alias Black market), especially the entrances of them. The bus stops close to the State department stores are hot spots for this activity. If you've been attacked or pick-pocketed, please take time to make a deposition at the district police station and to notify your embassy if you have one. Unfortunately, xenophobia is rampant, and violence towards foreigners happens often. Violence is part of everyday life in Mongolia and especially in the capital violent crime rates are among the highest in Asia. Alcoholism is a huge social problem and Mongolia. Do not acknowledge or approach any Mongolian man under the influence of alcohol. Nearly all foreigners who go to bars / clubs at night report assault and general aggression. Walking on the streets at any time is a hazardous affair as one needs to contend with ice from about October to March, open manholes and extremely chaotic and wild driving habits. Drivers (including buses and police) pay no attention to pedestrian crossings and will not reduce speed but simply sound their horns. The automobile culture in this city is too new to have developed safe driving systems and habits. Unmarked taxis are common and shouldn't be feared. Locals simply stick out an arm and hitchhike anywhere around town. However, it is wise to get a local to interpreter if possible and explain the fare system. Child beggars may be seen, but watch out for groups of them, as one may be trying to pick your pocket. Also be aware that any money you do donate will go straight to their teenage "pimps", and so you may not be helping them as much as you think. Walking at night in company shouldn't be too great of a concern; it isn't for the locals. But stick to areas where you can see lots of locals (especially women). Coming out of bars late at night is a little dangerous if you are alone; try to have several males in your group. There is a train that originates in Ulaanbaatar and departs for Moscow twice a week, taking 94 hours to make the trip and costing ₮308,606 for second class or ₮479,498 for first class. Another weekly train departs Beijing for Moscow, passing through Ulaanbaatar. There are two trains weekly originating in Ulaanbaatar and terminating in Beijing, and a further weekly train that passes through Ulaanbaatar on its way from Moscow to the Chinese capital. Daily trains leave to Irkutsk in Russia, Hohhot in Inner Mongolia and Erlian, just over the Chinese border, from where there are further rail and bus connections. This page was last edited on 6 November 2018, at 11:01.